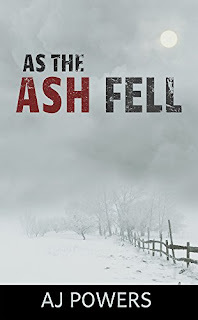 As the Ash Fell by AJ Powers. I always like a good post-apocalyptic novel, I don't know why, it's not like I want the world to come to an end but I enjoy reading about the creativity, the bravery and hardship that follow these types of novels. Sometimes I can't help but picture what I'd do if faced with a horde of zombies coming my way...... I'd probably trip my family up and use them as bait while I escape. As the Ash Fell is based on Clay as he and his sister struggle to provide for their family of 10 orphans, yes that's right 10 orphans! The story follows Clay's day-to-day involvement as he interacts with various groups of people some friendly, others not so much, as well as how fights to protect his family. Another dimension's added when Clay stumbles upon Kelsey and her daughter as they are about to be attacked by murderous thugs and of course or hero can't let that happen. You know what, I rather enjoyed the book and I liked the characterisation of Clay and Kelsey. They both grew as the book progressed. Yes, Clay was a bit too saintly for my preference but it was never eye rolling stuff. I thought the story was well written and the author made things simple, he didn't try to overelaborate when describing action scenes which made it flow more easily. I did also appreciate that Clay was not disguised as Rambo, he was vulnerable and (to my slight frustration) got his share of beatings, but his courage and sense of virtue proved to be his strength. The only negative I would say, and it is only a slight one, is that I thought there was too much emphasis on the romantic side of things and at times it felt more like a romance novel, but hey in a world where someone will kill you over a can of tuna, you need some love. A very good dystopian novel about hope, survival, and the importance of family in such a desolate world. It's not your typical macho-alpha male book that describes in endless pages about this gun or that one, so if you're pasionately into your guns and action then you proably won't enjoy this book as much, if however you want to read about a tale of human endevours and the values people hold in times of bleak despair, then give this book a try.